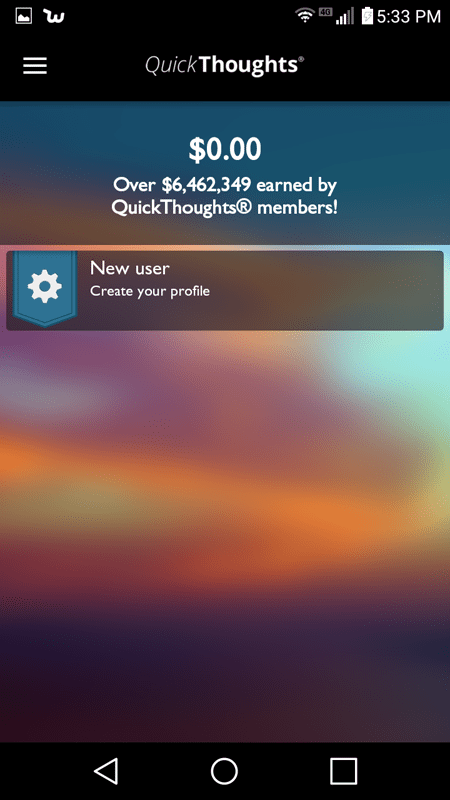 Can You Really Make Money With The QuickThoughts App? This app, which is available for free on the Google Play Store, claims to be able to help you earn free gift cards, just for taking surveys and going on missions. But can you really make money with the QuickThoughts App? I’ve reviewed many survey apps in the past—including survey apps that sent you on missions, and I will admit that I have never been super impressed by them. But, I am always willing to give a new app a try. I’m also always looking for ways to earn a little bit of extra cash, so this app stuck out to be because it promises to provide you with cool gift cards (which are pretty much like cash) for your help… so I decided to download it to see what all the fuss was about. First of all, let’s take a look at the basic Google Play stats for the app. According to the listing, it has been downloaded over 1 million times, and has a rating of 4.1 stars, which is pretty good. It has been reviewed by over 50,000 users, indicating that it seems to have quite a large customer base. This all sounded pretty legit to me—but I was ready to open up the app and take a look for myself. Here is what happened when I did. The first thing that happened when I opened up the app was that I was asked if I wanted to use my current location. 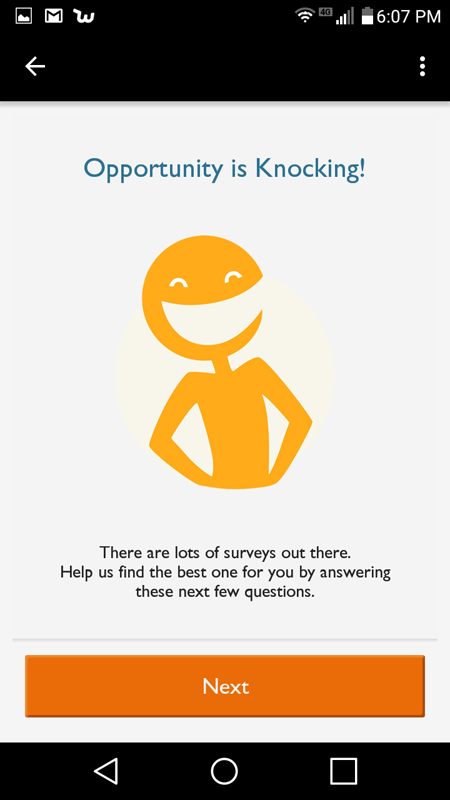 I clicked ‘OK,’ because you generally need to have your location turned on to be able to access a lot of the surveys and missions on apps like this. 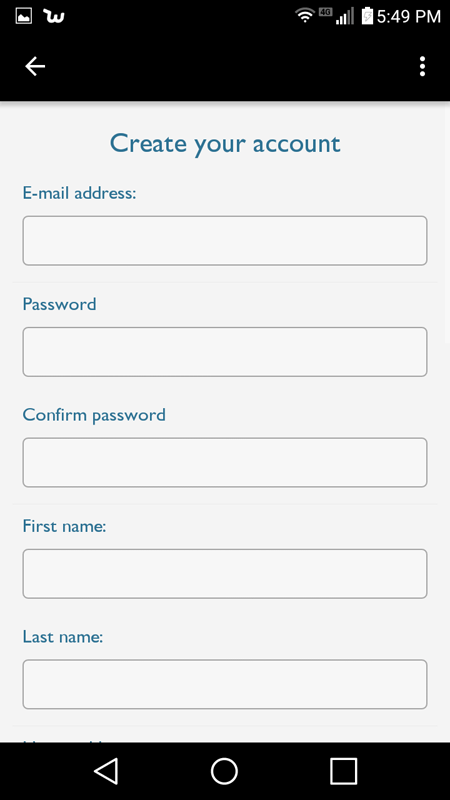 Next, I came to the log in/sign up screen. Then, below this, there was a button that said ‘Register.’ So I clicked on it. Next, I was taken to a terms and conditions page. It was quite simple, and I agreed to the terms without a problem. Here I needed to create a profile, so that’s what I did next. I was a bit disappointed that I couldn’t just use my Facebook login to create a profile on this app—but oh well. It wasn’t a big deal. Here is what the registration page looked like. I filled out the registration information, which was pretty easy, to be honest. Once I was done, I came to this page. Right away, I saw that there was a Mystery Shopping Opportunity that I could take part in. That seemed pretty cool! So I clicked on it and decided to give it a try. It looked like this opportunity was worth $20… which is really awesome! But in order to qualify, I first had to take a survey to see if I met the criteria. I got about half way through this qualifying survey, which mostly asked me questions about me (my age, gender, et. ), when I was told that I didn’t qualify. I thought that this was a funny thing to pop up right after not qualifying for a big $20 survey… but what the heck… I gave it a great rating, just to be nice! When I got back out to the main screen, I realized that I had somehow earned 10 cents—which was kind of nice! I know that that isn’t much, but I hadn’t even done a lot yet (I had filled out my profile and half a qualifying survey… but I didn’t expect to get paid anything for either of them). So this was a bit of a pleasant surprise for me. 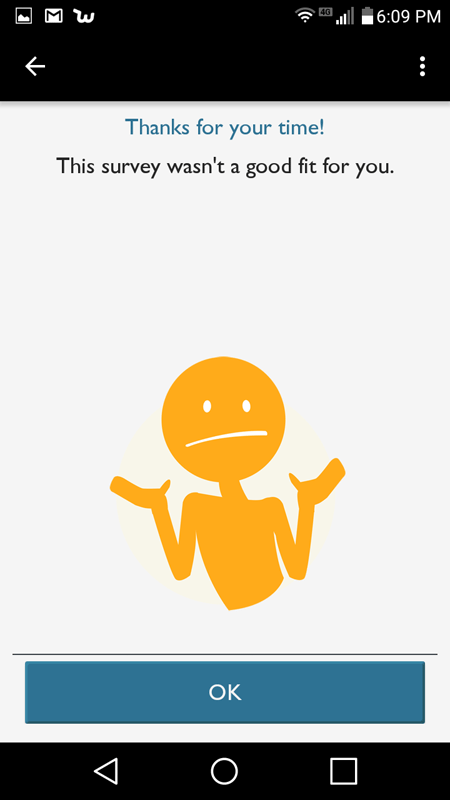 But I really wanted to see if I could even find a survey that would work for me on this app, so I clicked on the ‘Find A Survey’ button located at the top of the menu. Here is where it took me. More surveys to find surveys. Whatever. I figured I was game, so I moved forward. After going through a survey that asked me a bunch of random questions about what types of products I buy and what type of job I have, I got to this screen. Ok. This was disappointing. So I exited out and went back out to the main screen, only to find this. Well, I had no survey opportunities to take part in at this point. So this left me with little to do other than to find out what types of gift cards you can get in the app. So that’s what I looked into next. 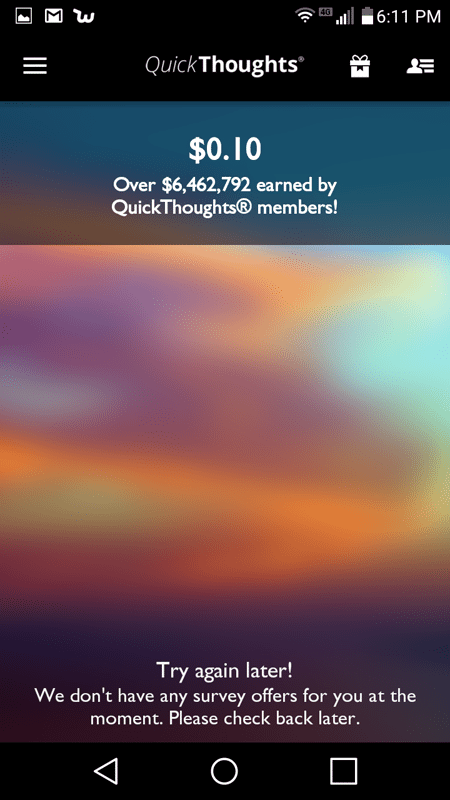 What Gift Cards Can You Get With QuickThoughts? I went to the drop-down menu, located in the top left corner of the app, and found a ‘Redeem’ button. I clicked on it, and was taken to this page. So, it looks like a $10 Amazon Gift card is the only option. But this isn’t really such a bad thing. 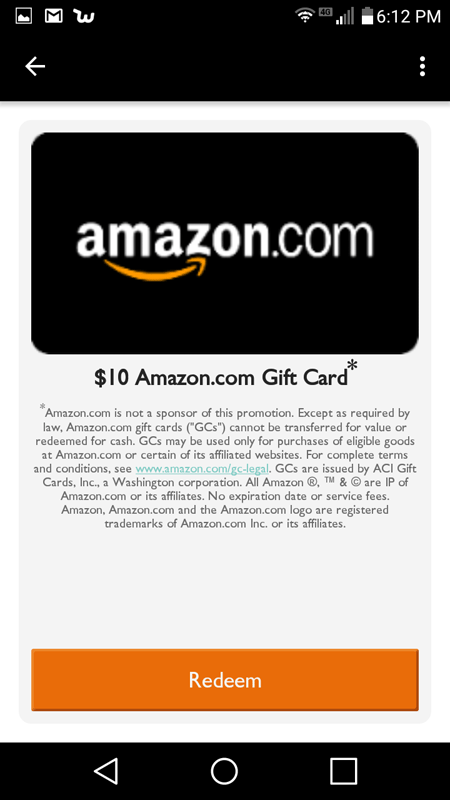 Everyone loves to get Amazon Gift Cards, and having a $10 cash out minimum isn’t too bad either, really. At this point, I felt like I had pretty much figured out everything I needed to know about this app to make a decision about it. There were some good points and some bad points, but ultimately—I needed to decide if I was going to leave it on my phone or not. Here is what I decided. 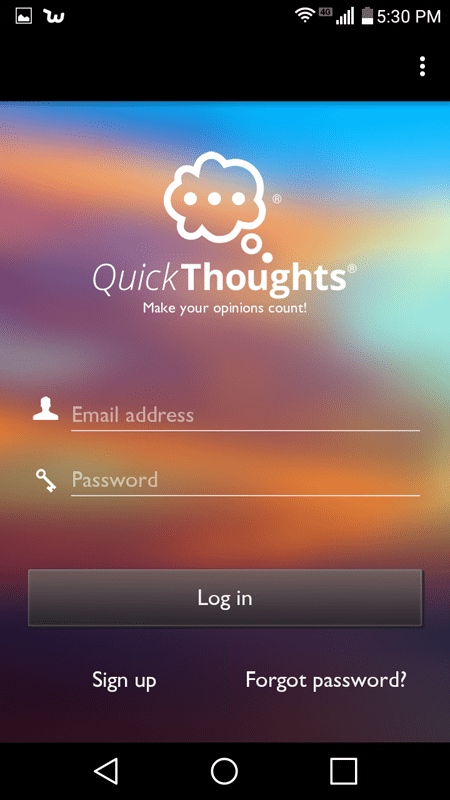 Did I Decide To Leave QuickThoughts Installed On My Phone? I had mixed feelings about this app. It was pretty easy to see that you can make money with it, as evidenced by the chance at the $20 mystery shopping task that I failed to qualify for. It must also be taken into account that I live in a really rural area, so mystery shopping opportunities are probably going to be more prevalent in larger cities than around where I live. I am not a huge fan of mystery shopping and survey missions and the like, mostly because they sometimes require you to be at a certain place, which may take you away from your normal routine—and to me, that almost defeats the purpose of using apps to make extra cash. But I have never seen an app prepared to shovel out $20 for a mystery shopping trip, either! So that is a bit new. In the Google Play Reviews for the app, it is obvious that users are earning a lot more using this app than people typically are with other survey apps. Users have said that they are making around $3 for regular short surveys, and that earning money for $10 Amazon Gift Cards is both easy and fast. The app also seems to function pretty well. There are some reports of glitchyness happening in the reviews, but all in all, the app seems to be in pretty tip-top shape. Plus, it has a good Google Play Rating… so that says quite a bit as well. 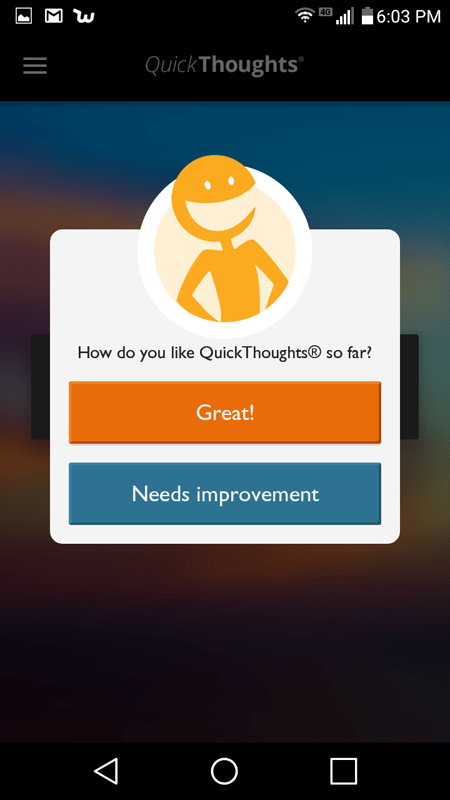 On the downsides, it doesn’t seem like I would be able to find many surveys to take with QuickThoughts. I am not sure if everyone has this much trouble finding surveys with it, or if it is just me/the area I live in. But I wasn’t able to get any surveys after registering and firing it up, and the long term isn’t looking any better. But as for me, personally, I will probably not be leaving this one on my phone. It’s a fine app, and I was even impressed by it a bit—but all in all, I feel that I can find better ways to earn extra cash. Should I download it and use it on my phone? I’ve been doing the surveys for a month now. I’ve made $160 in Amazon gift cards. I’ve received OFFERS for mystery shopping but haven’t been able to go. They were paying $8.